Warehouse order fulfillment has become an increasingly complex process by which companies must efficiently receive, process, and ship a wide variety of products. Maintaining inventory and responding to sales orders without the proper order fulfillment equipment or order picking software systems is a recipe for inaccuracy and inefficiency. Fortunately, Westfalia offers a suite of order fulfillment solutions designed to meet the fast pace and dynamic needs of today’s modern business. Westfalia's automated storage and retrieval system (AS/RS) can virtually accommodate any strategy, whether manual or automated order picking, and handles products of all shapes and sizes. 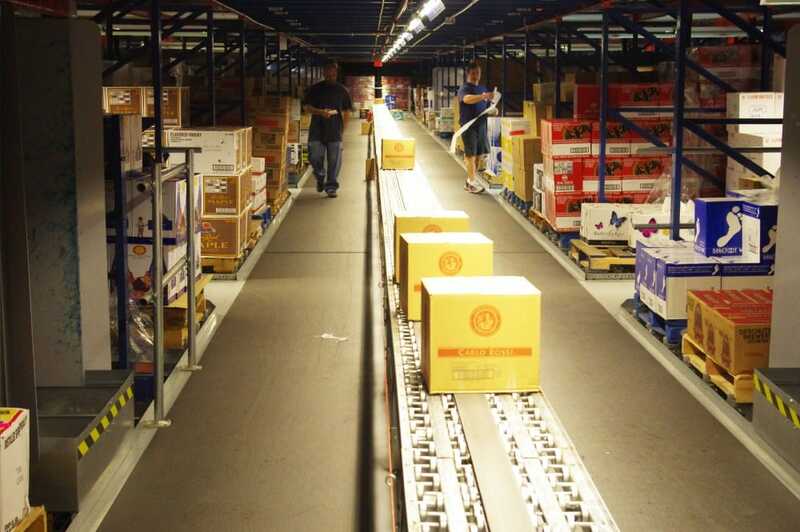 During the order fulfillment process, operators can configure their system to control routes and sequences to enable better overall performance of the warehouse. The AS/RS also utilizes pick-to-light technology and voice picking solutions to effectively organize, manage, and retrieve items regardless of their size, moving speed, and whether or not they are palletized. The aim of an automated order picking system is to reduce costs by eliminating the need for workers to travel and search for items. Westfalia’s ability to link 100% of reserve storage to the individual warehouse order selector reduces double handling often found in classic single-deep and double-deep storage systems. It also gives warehouses the ability to strategically store products and create more space for additional inventory. This directly reduces labor and storage costs, which ultimately passes savings to customers and drives a business's competitive advantage. The software that powers our order fulfillment management systems is our Savanna.NET® Warehouse Execution System (WES), which enables you to easily manage every aspect of your order fulfillment operations. By combining the best features of order management, warehouse management, and warehouse control systems into a single, integrated solution, we reduce your costs and improve your operational efficiency. If our order fulfillment software is the powerful brain behind our order picking solutions, our equipment is the strong, flexible musculoskeletal system. From warehouse conveyor systems to pallet racking systems, Westfalia has the warehouse picking equipment you need to build a reliable, efficient order fulfillment system. Low-maintenance, durable, and completely configurable to your applications, conveyors are a critical piece of equipment for order picking and packing when you need to move product quickly over great distances or in non-linear or vertical pathways. We can also customize conveyor systems to the needs of your fulfillment system. Our flexible, durable gravity flow systems work side-by-side with our order fulfillment software and AS/RS to help you organize inventory efficiently. The ideal order picking equipment for high-density storage, we can customize a pallet storage solution to virtually any application. The advantage of a solutions-oriented partner like Westfalia is our ability to integrate our powerful warehouse management software into virtually any configuration of order picking equipment. Speak with a member of our design team today to discuss how our solutions can enhance and improve your warehouse technology. Our pick-by-voice system is ideal for warehouses with a high number of SKUs spread across a large facility. Seamless integration with your order management system or warehouse management system (WMS) provides enhanced accuracy and efficiency. An ideal order fulfillment solution for operations with a low number of SKUs, our pick-to-light systems provide hands-free picking for accurate, efficient stock handling. And because our systems integrate with new and existing storage systems, you can maximize your order filling system’s output while minimizing capital investments. This manual order picking solution is ideal for fulfilling orders of small to moderate sizes. Your equipment and labor costs remain low, allowing you to operate your fulfillment systems economically. The Radio Frequency Mobile Picking method is a paperless order picking model that uses handheld RF scanners and mobile devices for order fulfillment of large quantities of different products or for volume where pick-to-light is not justified. Why Choose Westfalia as Your Order Fulfillment Partner? Westfalia understands that every business has its own processes, so a “one-size-fits-all” system isn’t always optimal. Your business needs an order picking strategy and technology optimized to the unique needs of your business. Our experience tailoring order fulfillment solutions with best-in-class software and picking equipment is what sets us apart. For more information on how Westfalia can provide your customized order fulfillment management system, contact us today.